Hiya guys. I hope you guys are having a good day with what ever you may be up to. It's time for my favorite day of the week and one of my favorite television shows, Pretty Little Liars. 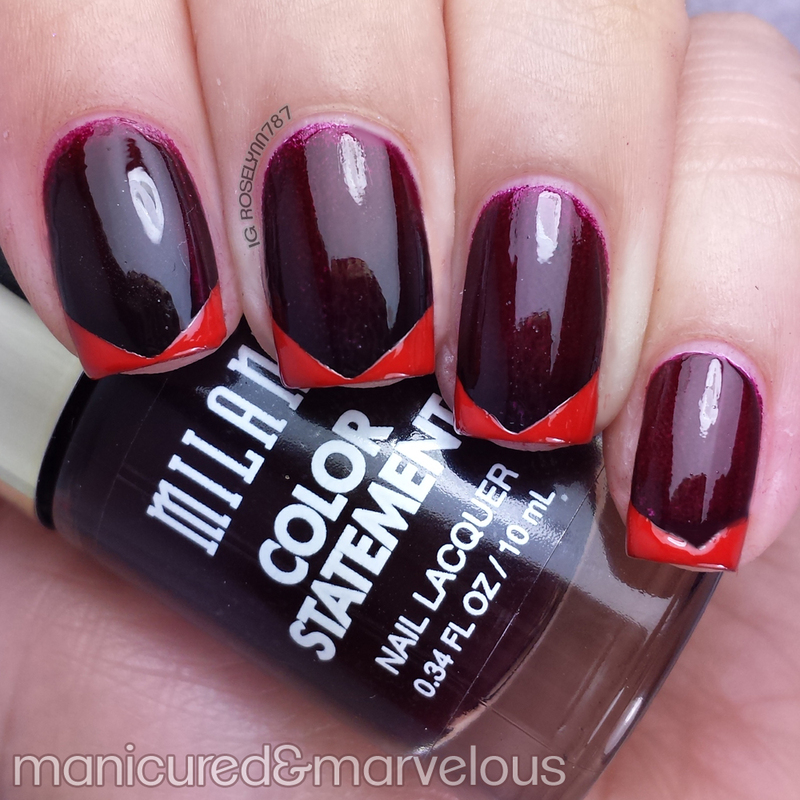 It's getting a little bit harder and harder to come up with red color-schemed manis for Red Coat Tuesday. But we're getting down to the season finale of Pretty Little Liars with only four episodes left. I'm certainly on the edge of my seat with this show! It's a must watch every Tuesday night with my husband. And I know what you're thinking, but I actually don't force him to watch haha. For this week, I ended up coming up with something rather simple. I'm feeling really 'meh' about today's mani, what do you think? Maybe if I had used a different shade for the tips I would of liked the overall look. Definitely not what I intended when I went into this mani. I'll have to try again with the look I actually had in mind with other colors sometime. 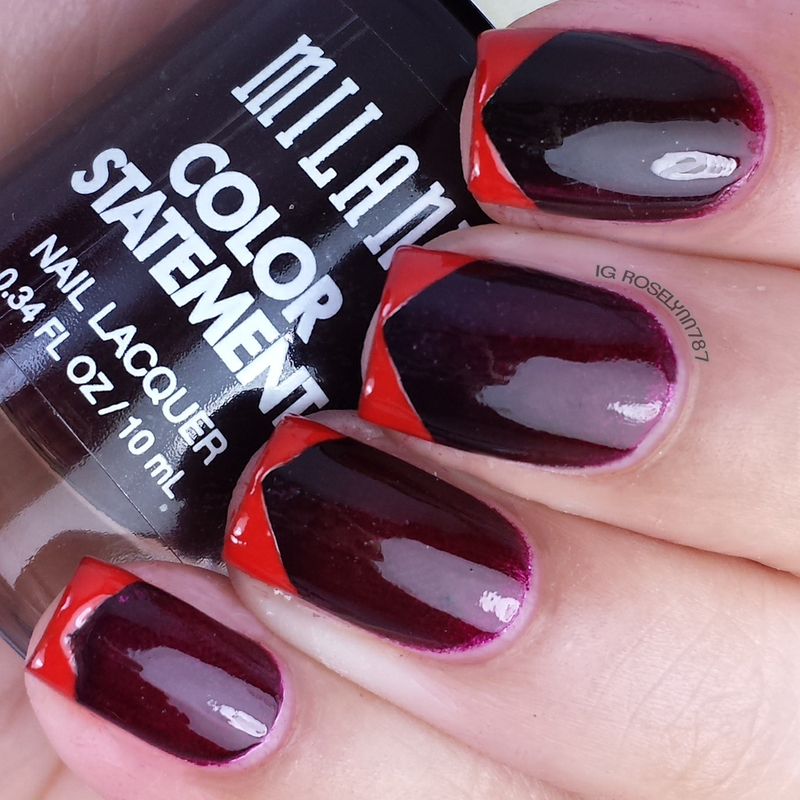 Accomplishing this mani is pretty simple, I created the vampy gradient using Milani Color Statement Enchanted and Sally Hansen Black Out. After that, I used my favorite vinyls for the tips. Sealed, of course, with my super glossy topcoat to give it a beautiful shine. Make sure you visit the other fabulous ladies in this weeks Red Coat Tuesday. I think they came out awesome. I love seeing how other people do their nails so I get ideas for my own! Simple yet fabulous! I really like the difference in the two shades of red. I love the colors you used. I usually use reds for my own manicures. That deep shade you used as a base is just gorgeous. Those are beautiful! You did such an awesome job - and I love the color! 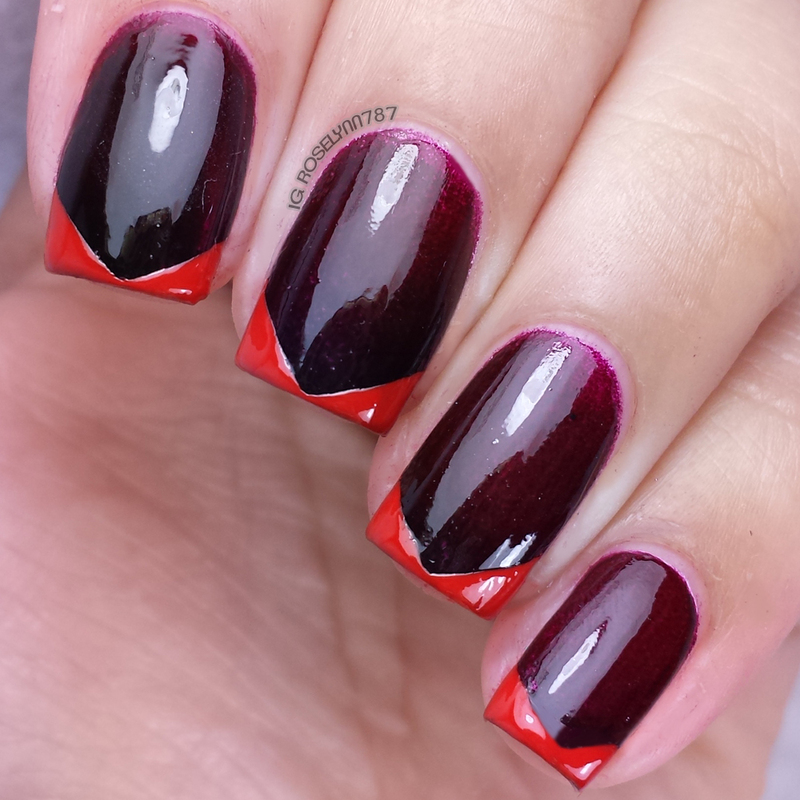 I love the gradient and the tip idea, but maybe a different colour - matte black? - would be better.. I really love how this mani turned out! That color is so gorgeous. I'll have to get a bottle for myself soon. What an absolutely gorgeous manicure. The colors are great, and it is overall very modern. I can't believe how detailed you were able to get on the tips. That's a pretty cool color combination! I absolutely love the color combinations for this! I'll try something like this out next time. Cute! I like the tips a lot...it has a very PLL feel to it! You have the best nail art girl! I wish I could do half the things that you do! I was reading through to see what the red was and how you got the angels so perfect. I didn't even know they made vinyls for nails lol. I'm not much of a glam girl, but when I buy polish it's really "out there" colors like this one. I like different! That is simply gorgeous and unique! I would have never thought of combining red and burgundy. Also, I love how you reference Pretty Little Liars. That's my favorite show, too! That color is beautiful. What a stunning technique. I need to try that! Those nails are so beautiful! I love the details and the color. So pretty! I love how that turned out. Those colors are absolutely stunning. The shades clash a bit, but I love how crisp and bold the tips are! Sometimes I wish I could be bold and wear red nailpolish. I am more of a neutral color kind of gal. I have olive skin and bright colors tend to wash me out. It looks great on you! I like the color combo. And I like the design on the tips! I really like the colour combo actually! Maybe you would have preferred reversing the colours? Looks good to me. I hate that I can't polish my own nails... I'm challenged in that area. I love these tips! They are so cool! That base color is vampy and fantastic! That is a beautiful color. The only problem is that i would pick it off to fast. Wow, you got the angles so perfect! I'm not sure I'd like this look on me, but I love the base color. Ooh I love the angled french tips! They're definitely different tones of red, but I actually like how they work together. :) Great job! Such beautiful nail art! I love the design and your color scheme. Beautiful! Your nails looks great! Love the color. For some reason I have never appreciated having my fingernails done. But I am definitely a pedicure gal! I think one of my sisters will be very interested in this. I will definitely be sharing with them.